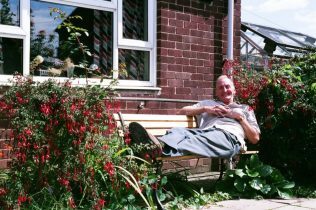 In 2005, I was contacted by a prefab enthusiast, Graham Burton, who lived in a prefab in North Wingfield, North Derbyshire. 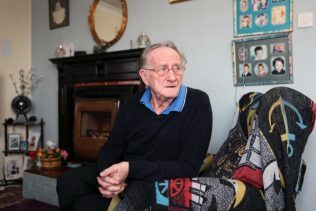 Passionate about the prefab he had bought in the 90s, he had collected lots of information about prefabs, their history, their location … He had found out about my documenting work on prefabs through the internet and wanted to share his with me. 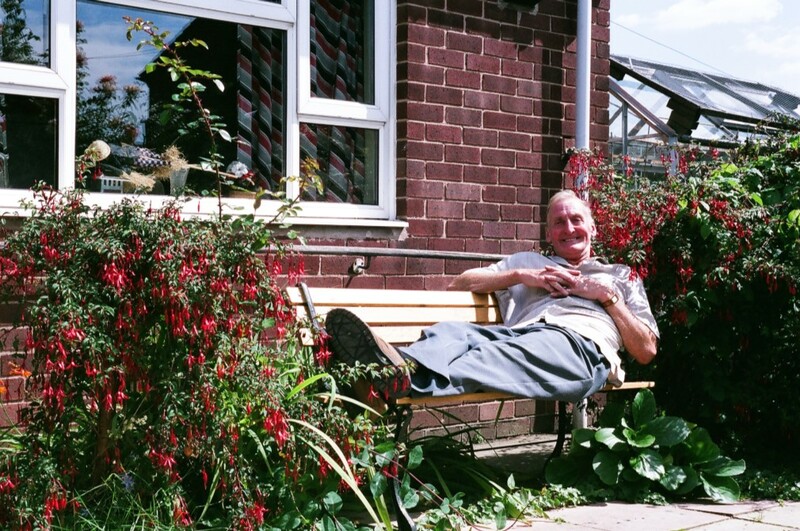 After a few email exchanges, he invited me to his prefab and suggested a little prefab road trip around North Wingfield and Chesterfield. I was over the moon. 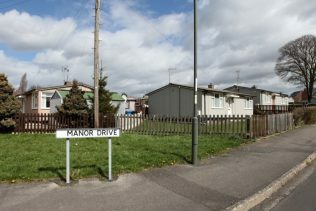 I had never been to that part of the UK and was all excited to discover “new” prefabs and from a type I had never seen previously : the Tarran type! As Mr Tarran had his company in Hull, most of his 19,104 produced prefabs were erected in the north of the UK. I remember clearly we had arranged for me to come on the 7th of July 2005. I dropped my kids to school near Goodge Street in Fitzrovia and caught a train to Chesterfield around 9am. When I arrived at St Pancras, there were a few police cars around and a weird atmosphere. I didn’t pay more attention to it as I was in a hurry to catch the train. I managed to get it and only a few minutes after we had left London, mobile phones started to ring in a sort of mad symphony. What was going on? Passengers’ faces were turning livid. I couldn’t get hold of anyone. My mobile phone wouldn’t work. Networks had been disconnected. The train manager made an announcement, telling us there had been bombs in different tube stations in London – one of them in Kings Cross – and that we were in the last train that had left London. It sounded like London was cut from the outside world. What was I to do? Try to go back by any means, which I managed to do through Leicester, Cambridge, Finsbury Park… And thankfully came back to a safe family. But I never reached Chesterfield that day. Of course, Graham understood and we rescheduled for exactly one month later. I remember it as a sunny summer day. After discovering Graham and his wife Maureen’s lovely prefab, we visited his neighbour Margaret’s prefab too, then we went on a lovely trip to places where Graham had spotted some prefabs: in and around Chesterfield and North Wingfield. There were plenty of prefabs pockets. When we could, we talked with the residents. Some invited us in and we were offered the usual and inevitable tea and biscuits! Everyone we talked to was attached to his or her prefab. I came back enchanted, with lots of films I couldn’t wait to process – yes, it was still the film era! 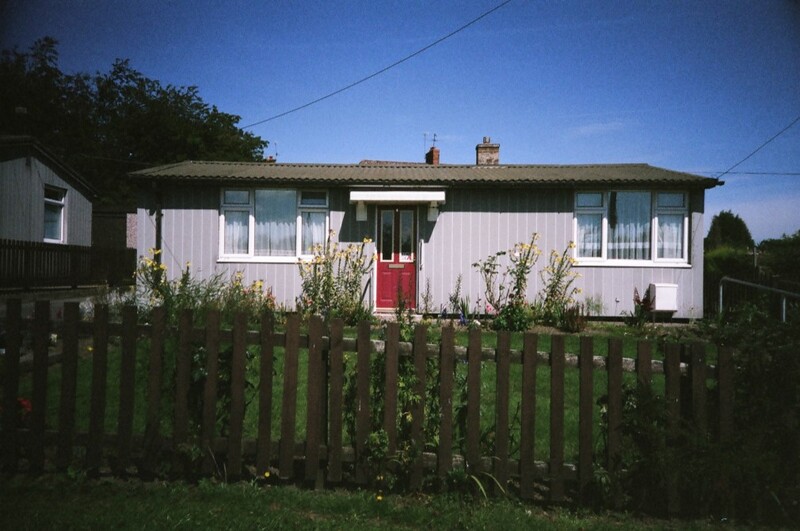 – and I was very happy with the result and the effect of a blue Derbyshire sky on the lovely prefabs. Graham and I kept on exchanging information, photos and discoveries. He is a natural prefab scout and regularly updated me on his finds. 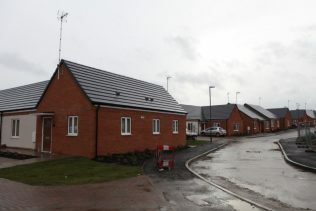 About five years ago he mentioned to me a few prefabs’ areas were to be regenerated and gave me the name of the housing company in charge, Rykneld Homes. I was curious to find out what their plans were. And since, I met them a few times, went with them in the field meeting lovely residents. They made it much easier for me to record and film residents and I could also see how they were dealing with them. Basically, their idea of regeneration was – and still is – to replace the Tarrans with similar brick bungalows which would cost them less to maintain. What they did, which I found really interesting and human, is spend a lot of time and energy talking to the prefab residents and ask for their opinion on the layout of their future bungalow, on the size of the garden, on the neighbours they would like to be close to… And what they managed to achieve is impressive: residents were not forced to move out of the estates. 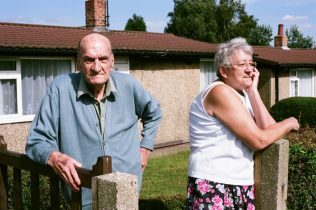 They stayed in their prefab till the end and moved out to live in their new bungalow straight away on the same estate. Peggy’s prefab souvenirs from The Prefab Museum on Vimeo. 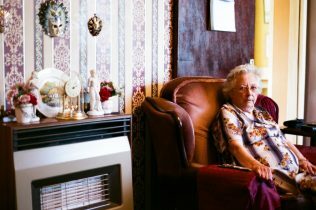 In February 2015, Peggy moved into a brand new bungalow a few yards away from where her prefab was in Eckington, North Derbyshire. She is talking with Siobhan from Rykneld Homes about what she kept from her loved prefab before she moved out and it was demolished. 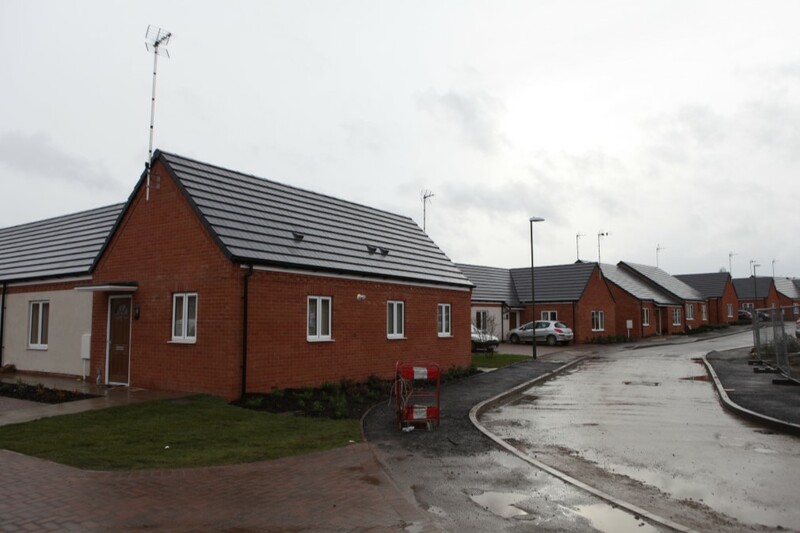 I personally think the success of Rykneld Homes’ prefab regeneration projects is their human and social approach. They listened to the residents, and to their stories. I was very touched they even organised a trip to London when I had my show, Prefabs: Palaces for the People at Photofusion in London in June 2013: a mix of Rykneld staff and residents came on a minibus to attend the preview of the show and the next day I took them on a tour of the Excalibur Estate. It was a rainy day and the state of the estate with the boarded up and derelict prefabs, the “left to rot” ones – as ex-resident Jim Blackender would describe them – depressed the Northern group. They found it unacceptable that local authorities could treat people like that. 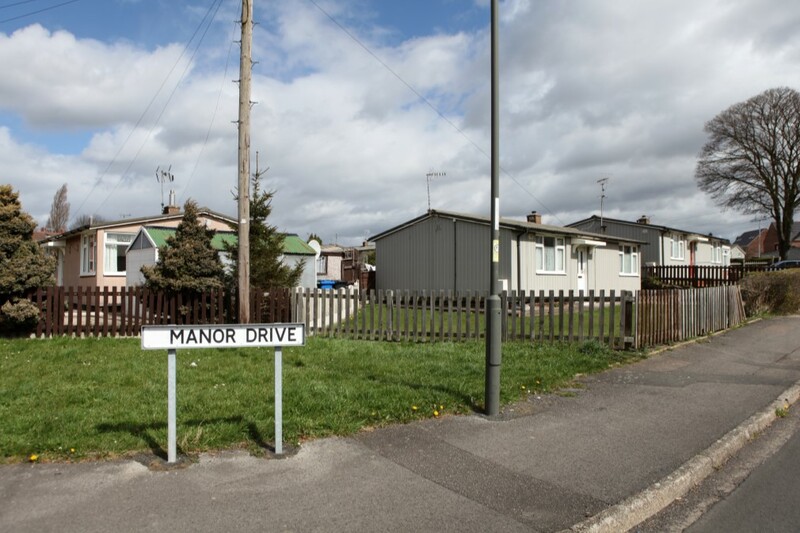 Back to North Derbyshire, prefabs’ enthusiasts will be happy to know there are still a few groups of them, particularly at the lovely and hilly estate on Old Brampton in sunny Chesterfield! 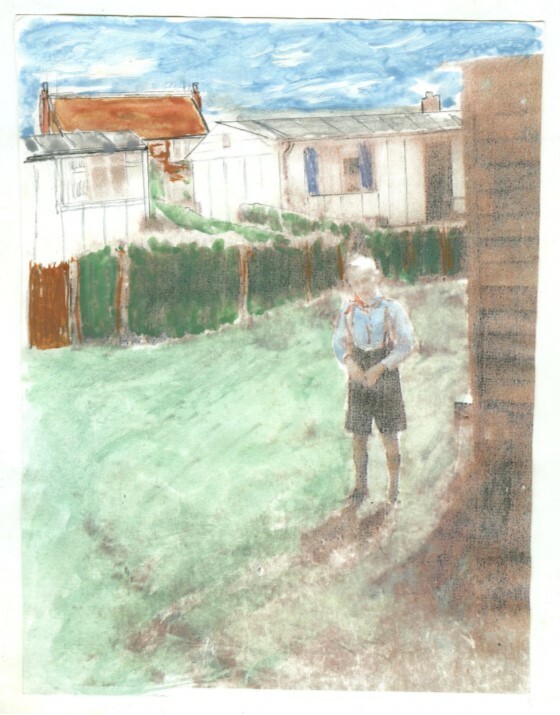 My husband and his lived in 2 Colonels Lane, Boughton-Under-Blean, Kent. It is a wonderful house in a not so wonderful location now. It was idyllic until they put in the bypass that runs at the bottom of the garden. So sad, I think we would be living there now if it was still in the middle of Apple orchards.